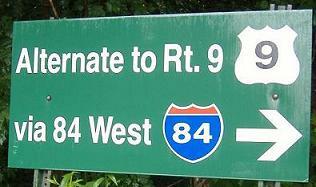 Ugly US 9 signs in the Westfarms Mall, right by the northern terminus of CT 9. 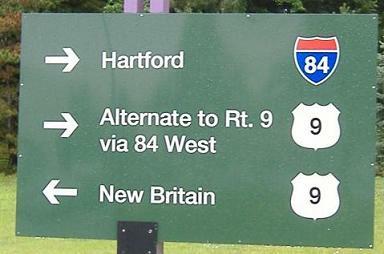 Actually, the 9 shields in the first sign are quite good-looking, except US 9 is over a hundred miles west. 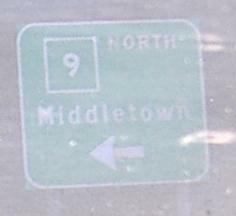 CT 9 is almost a freeway, but Middletown refuses to cooperate. 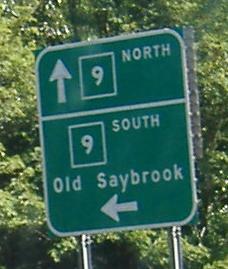 Exits 15 through 17 are at-grade intersections, with two controlled by traffic lights and one just by a stop sign. You'll see how this plays out in my photos, but from a traffic perspective, two lanes widen to three in Middletown for extra queuing space at the signals. It causes rush hour delays, but the only solution would be to elevate the riverfront highway, and the residents of Middletown would like to see the Connecticut River. Aircraft Rd. 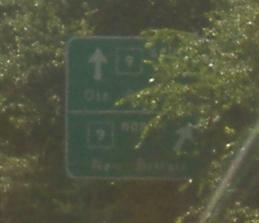 WB at CT 9 Exit 10 (first photo), then CT 80 EB. 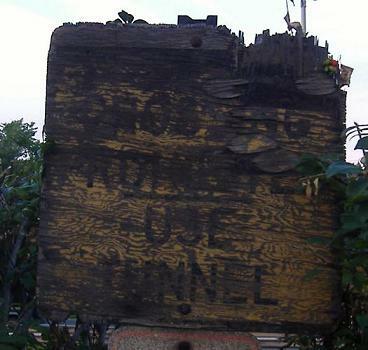 In Middletown, there is a tunnel under CT 9 to access the waterfront, and this ancient wooden sign [CROSSING PROHIBITED | USE TUNNEL] is the only hint for it. Sure they care.